Detailed information on insulin pump technology and insulin management. Not for the beginner! Unfortunately it uses US units for glucose and advertises the Walsh book, but that book is likely the best I've read on pumps! 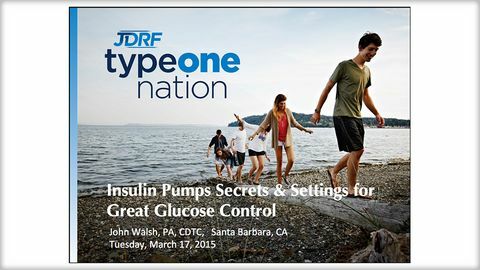 Slides from presentation given in March 2015 entitled "Insulin pumps secrets and settings for great glucose control". Outlines pump set up tips and various troubleshooting considerations. I do think this gives many good starting points although some slides did not provide any or sufficient narrative to be as useful as if listening to the presentation. I personally believe however that this could also fall into the trap of providing many text book assumptions which PWD are afraid to modify, should the suggested settings and calculations be not quite right for them. The danger with setting fixed methods for calculating basal:bolus splits, duration of insulin action, I:C ratios and carbs for treating lows is that everyone is so different, you cannot find one calculation that will work for everyone and the same calculation may work one day and not the next. If people read and use this information aware of these provisos, then I think the subject areas raised are valuable in encouraging a greater understanding of areas to consider and continue to tweak in managing T1 using insulin pumps.